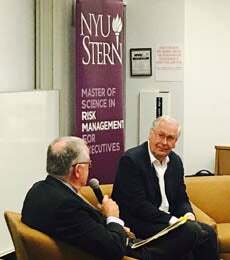 A group of industry professionals and Stern alumni gathered for a series of lectures and panel discussions as part of the 2016 Risk Management Symposium. 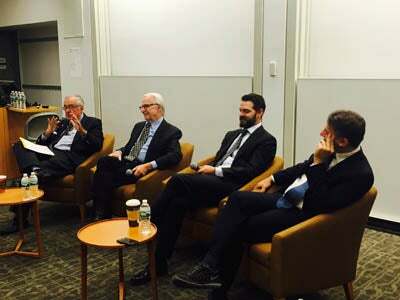 Speakers included Lord Mervyn King, NYU Professor of Economics and Law, who delivered the keynote address, as well as Stern Professors Gian Luca Clementi, Thomas Cooley, Manjiree Jog, Thomas Philippon and Ingo Walter. The symposium centered on thought-provoking subjects related to risk and the global economy. Practitioners from IBM, Deutsche Bank, Fitch Ratings and the Federal Reserve Bank of New York shared their insights into current risk management issues. Panel topics included "The ‘New Normal’ Macroeconomic Environment," "Liquidity Conditions in the Treasury Market" and "Investment-Grade Sovereign Bonds: A Potential $3.8T Problem."